At a time when Steve Jobs was only a teenager and Mark Zuckerberg wasn’t even born, a group of visionary engineers and designers—some of them only high school students—in the late 1960s and 1970s created a computer system called PLATO, which was light-years ahead in experimenting with how people would learn, engage, communicate, and play through connected computers. Not only did PLATO engineers make significant hardware breakthroughs with plasma displays and touch screens but PLATO programmers also came up with a long list of software innovations: chat rooms, instant messaging, message boards, screen savers, multiplayer games, online newspapers, interactive fiction, and emoticons. Together, the PLATO community pioneered what we now collectively engage in as cyberculture. They were among the first to identify and also realize the potential and scope of the social interconnectivity of computers, well before the creation of the internet. PLATO was the foundational model for every online community that was to follow in its footsteps. The Friendly Orange Glow is the first history to recount in fascinating detail the remarkable accomplishments and inspiring personal stories of the PLATO community. The addictive nature of PLATO both ruined many a college career and launched pathbreaking multimillion-dollar software products. Its development, impact, and eventual disappearance provides an instructive case study of technological innovation and disruption, project management, and missed opportunities. 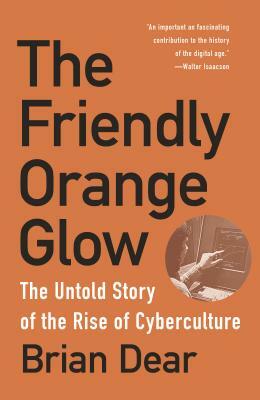 Above all, The Friendly Orange Glow at last reveals new perspectives on the origins of social computing and our internet-infatuated world. BRIAN DEAR is a longtime tech-startup entrepreneur and the founder of companies including Coconut Computing, FlatWorks, Eventful, and Nettle. He has also worked at a variety of dot-com companies, including MP3 and eBay, and he worked in computer-based education for eight years, including five on the PLATO system. He has written for Educational Technology, BYTE, IEEE Expert, and San Diego Reader. Dear lives with his wife in Santa Fe, New Mexico.